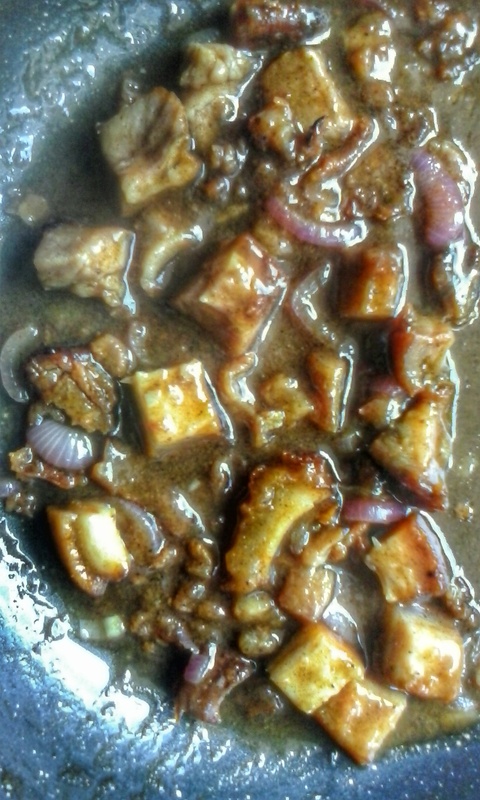 Another left over food make over, we had roasted liempo (pork belly) last night and there was more than enough for the two of us. This morning it’s already a day since it was cooked the meat gets quite dry and chewy , I have to do a make over to make the eating experience enjoyable. Lechon Paksiw is commonly cooked if there is Lechon (Roast) leftovers usually from occasions like fiesta. You can also use lechon kawali (Pan-Fried) leftovers. Paksiw is a local filipino dish where food is cooked with vinegar, garlic and onion. The Lechon Paksiw adds Lechon sauce or gravy that makes it more special than the usual paksiw. So instead of reheating the Lechon (which just makes the meat dry) Filipinos transform it to a lechon paksiw which makes it more flavorful and enjoyable.